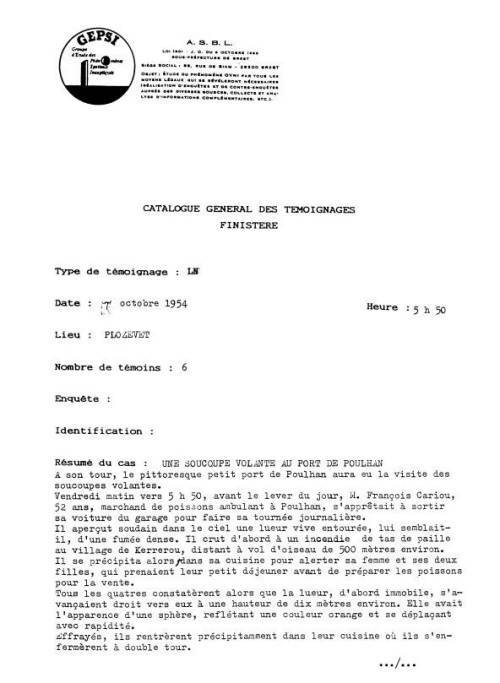 Reference number for this case: 8-Oct-54-Poulhan. Thank you for including this reference number in any correspondence with me regarding this case. In its turn, the picturesque small harbor of Poulhan had the visit of the flying saucers. Friday morning at about 5:00, before the start of the day, Mr. François Cariou, aged 52, traveling fish merchant in Poulhan, was on the point of getting his car out of the garage to make his working day round. He suddenly saw a sharp gleam in the sky, which seemed surrounded by a dense smoke to him. He initially believed in a fire of a heap of straw at the village of Kerrerou, distant of 500 meters approximately in straight line. He then rushed in his kitchen to alert his wife and their two daughters, who had their breakfast before preparing fish for sale. All four noted then that the gleam, initially motionless, advanced right towards them at a height a ten meters approximately. It had the appearance of a sphere, reflecting an orange color and moving fast. Frightened, they returned precipitately in their kitchen where they locked up their door twice. Oct. 07, 1954, early, Plozevet (France). The crew of several fishing boats saw a luminous, orange-colored object over the coast, apparently surrounded by dense smoke. Villagers saw the same object and stated independently that it came within 10 m of the ground, then flew away to the southeast. (41; M 140) (France-Soir, 9 Oct. 1954). The GEPSI file seems to be the transcription of a newspaper article. There is a problem with the date of the sighting. The text given by GEPSI says it was Friday morning. GEPSI dates the case of the 7th. But this Friday was the 8th. [jv1] "Passport To Magonia - On Ufos, Folklore, and Parallel Worlds", book by Jacques Vallée, Contemporary Books publisher, France, 1969.